When quality and style matter. Welcome to ILS, Intelligent Lectern Systems, your premier source for lectern and e-podium solutions. 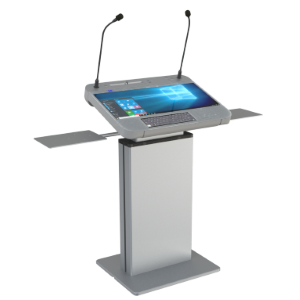 We have a wide range of touch screen intelligent lecterns for sale, for use in boardroom, classroom, university and at events. Choose ILS - when quality and style matter. 1) such as the 31” single glass sheet of the ILS22 that controls monitor, keyboard, room controls, i/o, relays, annotation, mouse and more with full plug and play multi touch. 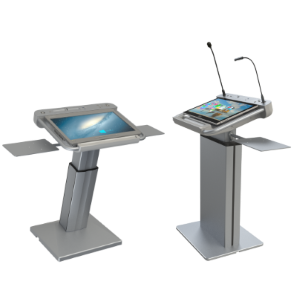 All our lecterns are very user-friendly and feature large embedded touch screens. 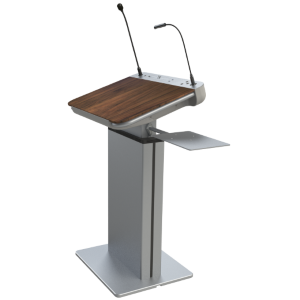 Several lecterns come with a choice of flexible options for audio and system control. Our intelligent presenter lecterns will allow you to run professionally organized events with seamless transitions from one speaker to the other. We have eliminated all distractions so your audience will retain what is being said much better. You can even schedule your whole event in advance - including setting the allotted time per speaker, and queueing up all presentations - to ensure that speakers or scheduled meetings do not exceed their allotted time. Improve your meeting productivity with sho-Q2020! Our intelligent teaching lecterns pair reliability and looks with modularity and ease of integration. You can integrate any modern tool needed in education, for example: multiple displays, annotation device, document camera, recording and conferencing equipment and software, and include extensive media -, system - and room control. All our systems offer options for automated set up for control systems, secure access and locking, remote assistance capabilities with sho-Q2020 presentation & annotation software included. We are happy to advise you on the intelligent lectern or intelligent e-podium that best suits your needs, and allow you to turn your presentations into professionally run events. ILS has dealer partners around the world to help you integrate ILS solutions and assure your implementation is optimized and complete from day one. 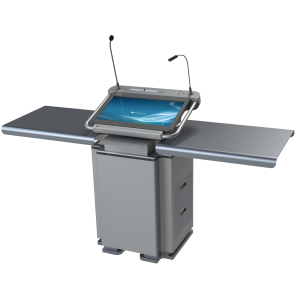 Sho-Q2020 Presenter software suite is specially written for touch screen lecterns. You can queue multiple presentations in advance for your event - whether they are Powerpoints, PDF’s or Web-based - within a few minutes. You can increase interactivity, and merge any document, webpage, interactive whiteboard sheet or a screenshot from the document camera directly into their presentation. You can also annotate on any slide, and your annotations are automatically saved for re-use. The presenter can control all slideshow functions with one touch of their finger, has easy control over animations and has full annotation support on any slide or page from any source, directly from the lectern monitor. The presenter can preview their notes and slides (previous slide, current slide and next slide) to effortlessly keep their train of thought. Though we take great care to ensure the information on the web site is as accurate and complete as possible, ILS cannot be held liable for any damages resulting from information on this web site. ILS reserves the right to change information on the site without prior notice. Product information, specifications and pricing subject to change.